One beautiful, sunny fall weekend in September, we made a trip to the Amish country in Northern Indiana. Driving through the rolling fields of corn, beans and soy, with patches of autumn colored trees was just amazing and so peaceful. We spent the afternoon at the local Apple Festival and enjoyed the sights of the homemade baked goods, Amish made items, apples, mums and Amish children in their simple, pretty attires. 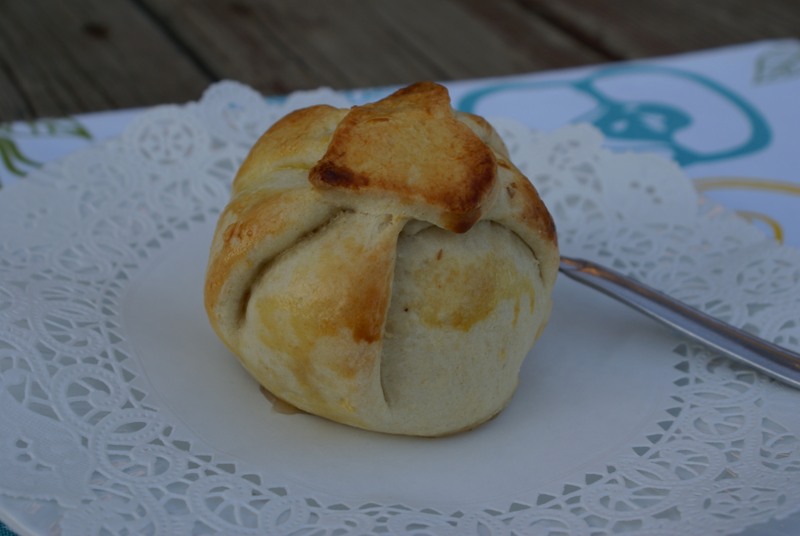 My daughter and I ate some wonderful apple dumplings with vanilla ice cream and since that weekend I wanted to make them myself. Today was a perfect day, since I bought some small Jonathon apples at the Farmer’s Market. 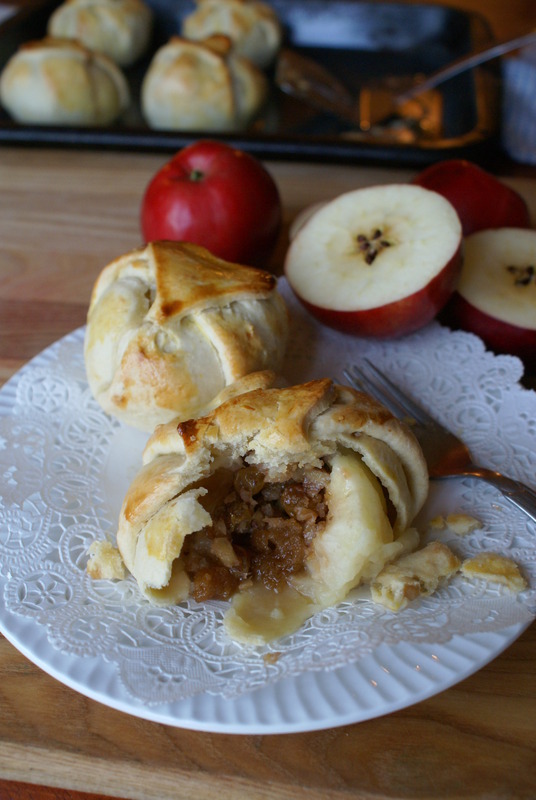 For this recipe, in addition to Amish apple dumplings I was also inspired by stuffed baked apples (a desert from Bosnia). The end result was super delicious! Take a look! 1. Combine flour, sugar, salt and lemon peel and mix well. Add butter and work it into flour until small crumbles form. At the end add the egg, knead it well. Wrap the dough in plastic wrap and chill for at least 30 minutes. 2. For filling combine raisins and walnuts, add brown sugar and rum (or cinnamon, or both) and set aside. 3. Wash, pat dry and peel and core apples. Brush with lemon juice and set aside. 4. Roll out the dough on lightly floured surface. 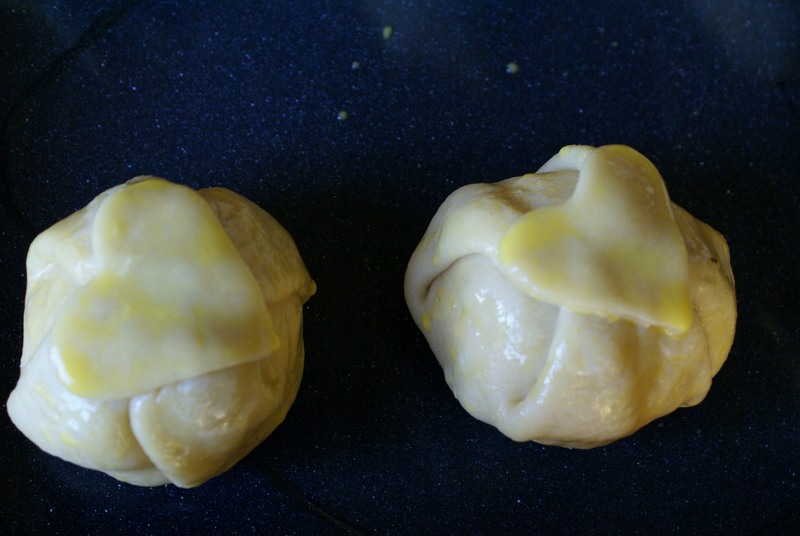 Using rim of a small bowl, cut out circles for the dumplings. Cut out decorative hearts, flowers, leaves or similar with a cookie cutter. 5. 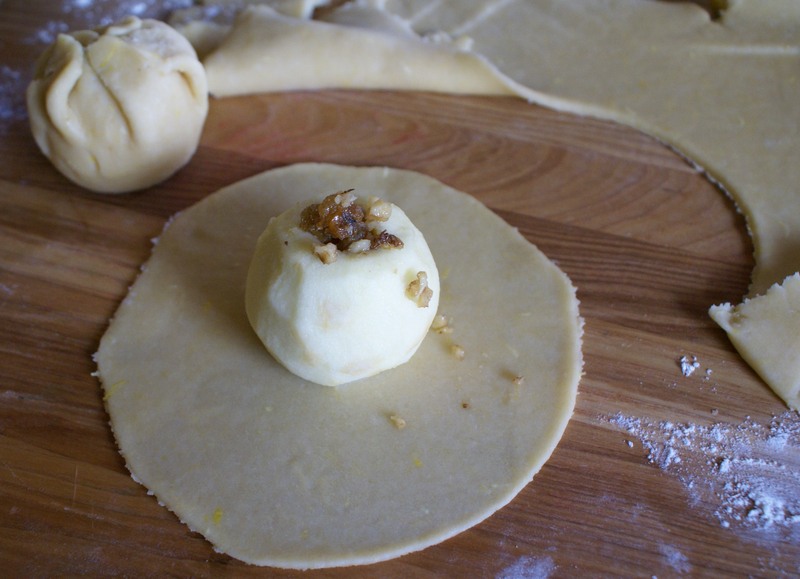 Place an apple in the center of the dough circle, fill the core with the raisin-nut mixture. Enclose the dough. Brush some water over the top and place the decoration. 6. 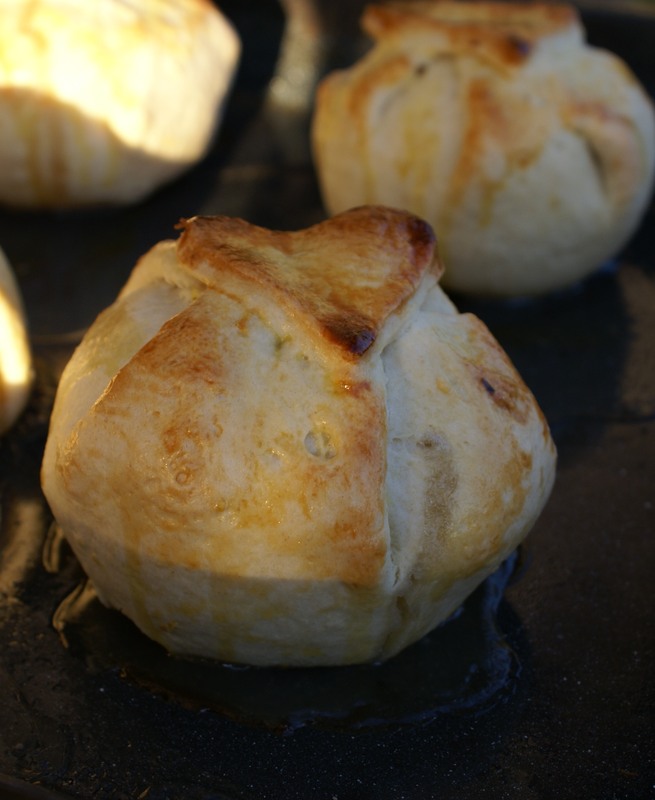 Place the apple dumplings into a buttered (or parchment paper covered) pan. Brush with egg wash and bake for 30 minutes at 375 F or 190C. 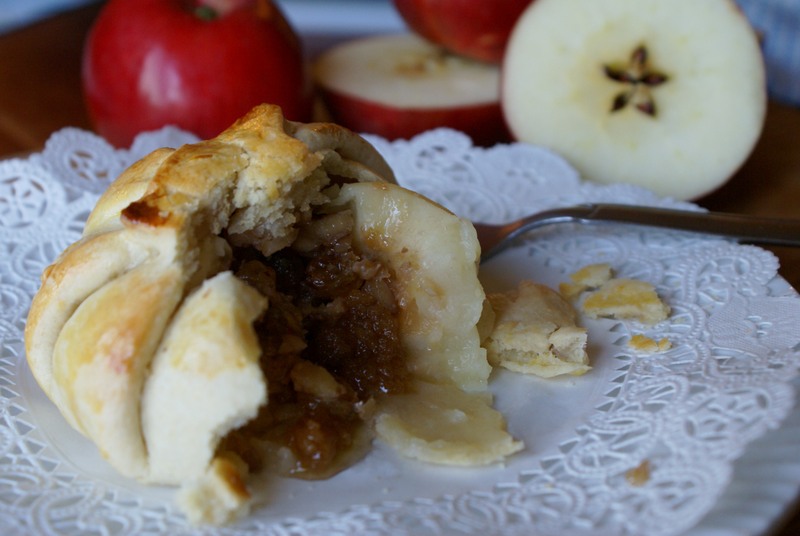 Serve warm, with vanilla ice cream or apple dumpling sauce. Note: I didn’t find necessary to make the sauce since the dumplings are already sweet and vanilla ice cream was just perfect addition. They are super cute – they’d go down so well with a little ice cream at a posh restaurant. Gorgeous and look delicious! 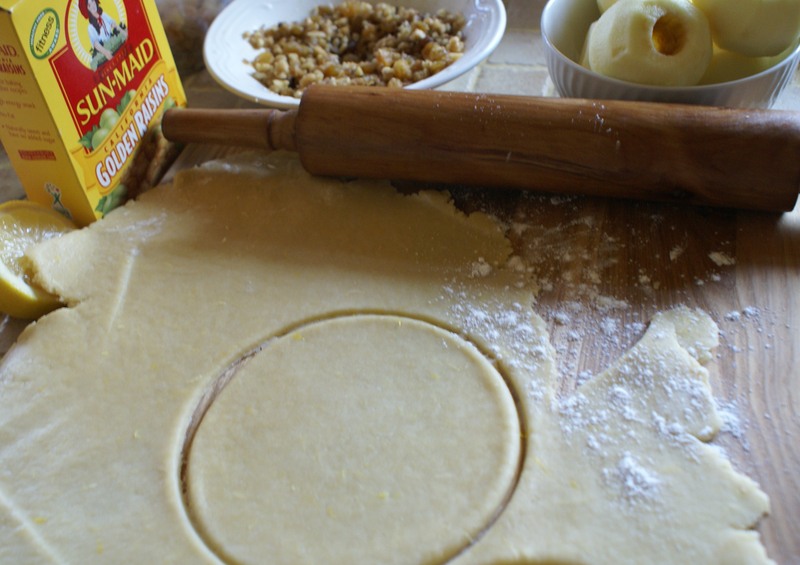 And they involve my favorite ingredient…pie dough. Can’t wait to try them! Thanks a lot! 🙂 I hope that you will get to try them and enjoy them as we did! Thanks for stopping by!